When it comes to listing the best linebackers in CFL history, Ben Zambiasi's name is certain to get mentioned along with greats like Wayne Harris and Dan Kepley. Zambiasi played 11 seasons in the CFL, 10 of those with Hamilton, winning East All-Star honours 8 times and CFL All-Star honours 6 times. Zambiasi signed with Hamilton as a free agent in March of 1978 and had an instant impact. He won both East and CFL All-Star honours and was named the Outstanding Rookie in the East. It was the first of five straight CFL All-Stars for Zambiasi (1978-82). He was runner-up for the Oustanding Defensive Player in the CFL in his second year in 1979, and won the award in 1981. 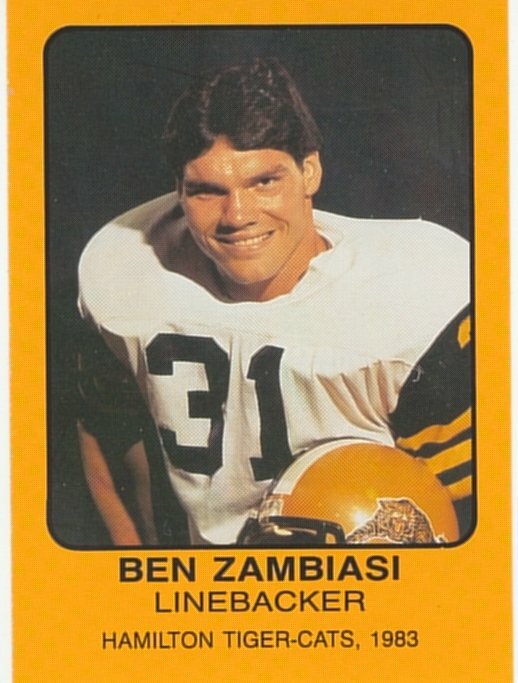 After one year of missing out on All-Stars honours in 1983 when he was limited to only 11 games due to injury, Zambiasi won three more East All-Star honours in 1984, 1985 and 1986, also winning CFL honours in 1985. Individual tackle stats were only kept starting in the last two years of Zambiasi's career, or else he would certainly rank among the all-time tackle leaders. The stats that there are for Zambiasi are 25 career interceptons (4 ran back for touchdowns), 19 fumble recoveries and 26 sacks (not counting three years where no stats were not kept). Zambiasi was a no-brainer selection to the Canadian Hall of Fame in 2004.